The LOST ARGs: I've managed to do it. This marks the beginning of the end. 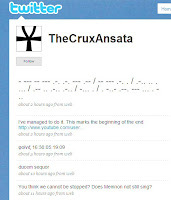 A Twitter update from TheCruxAnsata, who was one of the users that Elliott Graves had previously denounced, points to a video on YouTube entitled Osiris27. This seems to have something to do with the Valenzeti Equation. Click here to see the morse code translation. Thanks for the information, this seems to be a simple substitution cypher where a=s, b=t, c=u...etc. The rest of the posts from Edmund are other substitution cyphers with different start letters. This twitter user has just started following Elliott Graves so I think I'll add a new post.